Stop dirt before it enters the building. Need help with square footage? Mud, oil, inclement weather, spilled food & drink or pet accidents will cost you time and money when they stain or discolor your carpeting. If you're tired of cleaning up these messes, PlasticoverTM Self-Adhesive Carpet Protector is for you. The ultra-tough, slip-resistant plastic carpet protection film is simple to use. Just roll it out, and never worry about stains again! 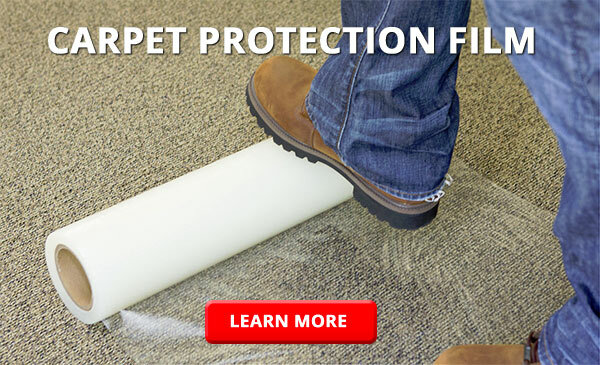 It is ideal for construction, remodeling, moving days, office parties, new carpet, paint days and any other time where quality carpet protector is needed.